Why my community loves the alewife herring. Why my community rallies around this weird little fish. My town has a fish. Or maybe the fish has us. 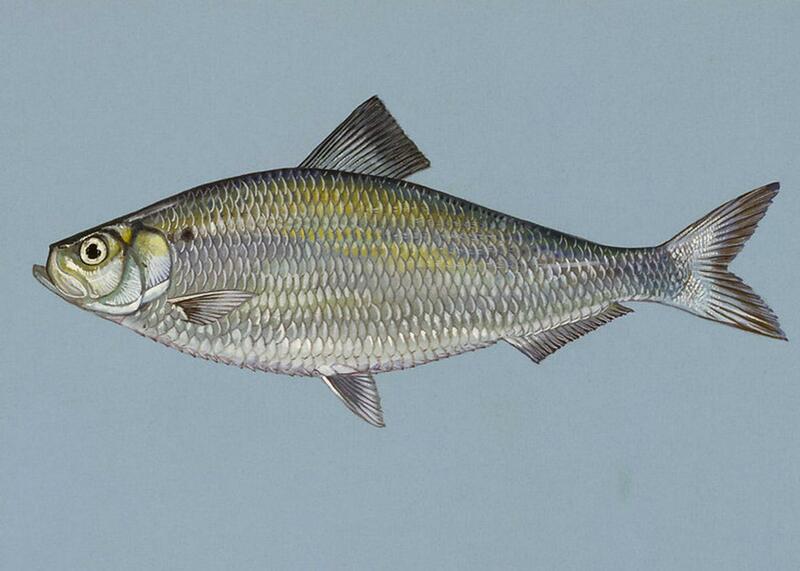 It’s a herring known as an alewife—about 9 inches long, with a forked tail and a belly that shines like hammered chrome. Every spring after the snow melts and before the leaves bud, alewives swim upstream from the Atlantic via the Kennebec River, follow their noses through a small tidal creek, and jump through a culvert, ending up in the freshwater pond where they were born. They spawn and head back to the sea in June. In August the spawn, which have grown from eggs to a few inches long, also depart for a life of adventure in the sea, where they hang out for four years, covering as much as 1,200 miles, before returning to spawn themselves. Alewives do not fit most contemporary definitions of delicious, but they do have a subtle fishy charisma that has captured the attention of dozens of my town’s 400-odd residents aged 10 to 90. Since 2007, they have spent thousands of hours monitoring and counting the fish. When the culvert became impassible in 2013, people even carried more than 700 fish across the road in buckets. In 2014, squads of volunteers, biologists, engineers, the Kennebec Estuary Land Trust, and the Maine Natural Resource Conservation Program collaborated to build an alewife-, beaver-, and turtle-friendly culvert. This surprisingly simpatico relationship between citizens and fellow fish started in the 1600s, when dandelion greens and alewives made a fine spring feast. And—with vigilance and luck—it could continue to the 2400s and beyond. The future of a fish in general is not assured: Oceans are warming and acidifying, and fish catches have fallen dramatically worldwide since 1996. Between 1950 and 1995, we turned the seas into an industrial site, more than tripling the quantity of fish we pulled from the depths. The poster child for failing fish has been the Atlantic cod, whose numbers drifted downward for centuries before collapsing in the 1980s—victims of overfishing and warming waters. So the alewife, with its deep cultural roots, may be a model fish of the future. It was once abundant in rivers and ponds from South Carolina to Labrador, Canada. But during the first wave of the Industrial Revolution, many of those rivers were dammed. In 1837, the Edwards Dam went across the Kennebec River at Augusta, Maine, bringing to a halt migrations of alewives and other herring, salmon, shad, and sturgeon. Pollution, including sewage, industrial waste, and runoff, got dumped in the rivers. Migrating fish numbers fell and fell and fell. By 1999 the era of industrialization was over, the mills and their jobs were gone, and the Clean Water Act had tamed pollution. A group of environmental advocates successfully petitioned to get the dam blown up. Over the past 10 years the population of herring in the Kennebec River alone has risen from just 50,000 to more than 3 million. Karen Wilson, an associate research professor at the University of Southern Maine, has been working on alewife restoration and dam removal for years. “We won’t go back to the abundance of pre-Colonial times,” she says. “But I think the future’s pretty bright.” The alewife has several advantages over other fish facing threats: It’s adaptable, willing to swim up another stream when a beaver has blocked its way. It is mainly fished for lobster bait these days, so there’s not a huge industry built around catching it. Instead of spawning in international waters, alewives do it in ponds tended by small towns. And finally, it’s fun to watch as it wriggle its way upstream, which makes it easier to get those towns to support it. I know about that firsthand. Spending time counting alewives is a highlight of my spring, and it’s allowed me to get to know my neighbors. But I wanted to find out just how alewives captured the attention of me and my townspeople. I found Karen Robbins at the culvert, counting fish that had landed in the town’s trap, a few minutes after 8 one morning. It was a gorgeous, warm day, and the alewives in the pond were jumping around us. Robbins runs a construction company, and in her spare time she maintains spreadsheets about alewives. Back in 2006, Robbins said, townspeople were trying to figure out what to do about high levels of phosphorus in the pond that led to summer algae blooms. Most of the surrounding property is conserved woodland, so there wasn’t an obvious source of sewage or fertilizer to cut off. But then they heard of a study showing that juvenile alewives carried phosphorus out of inland ponds. Ding! The town decided to try to combine lowering phosphorus and helping out the few alewives that still made it to the pond. So they signed up volunteers to clean up the area around the culvert, set up a trap (to count the fish), and organized a schedule of counting and releasing fish twice a day for more than a month. It’s a lot of work for such a small town, and after a few years it was clear the culvert needed replacing. People pitched in, with the town’s oldest resident working on the history of the fishery and an eighth-grader designing a T-shirt. While we talked, the fish continued to jump. “I love our fish,” said Robbins. “They were depleted almost to the last fish. Every memory of them was that they were better last year.” Since the project started in 2007, the number of fish returning to the pond has generally gone up, but some years are very high and others are lower. Nobody really knows what makes the alewife population tick one way or another. Robbins worries: “I hesitate to be hopeful. This requires vigilance. We need to support the ecosystem until it gets to the point where it can heal itself.” She points out that we’re not really “saving” the species, so much as we’re saving the genetic diversity of the particular stock that comes back here. In the event of a catastrophe elsewhere, the remaining alewives will have more resources to save themselves. You might think that all this fish love is a new thing, a kind of post-industrial green tizzy—putting up a tree museum after we’ve paved over paradise. But its roots turn out to be much deeper. The written record of alewives in the nearby Nequasset pond, in Woolwich, Maine, goes back to when local Native Americans showed Europeans how to smoke the fish. Regulations about humans’ responsibility to assure safe passage for the fish to spawning ponds are in the 1623 Plymouth Colony Fish Law, says local historian Allison Hepler. She sent me a quote from the minutes of a 1792 Woolwich town meeting where citizens prevented overfishing by setting alewife harvest days and established fines for those who “transgrefsed.” “Any person who transgrefes in Cetching said fish shall pay a fine of ten shillings and forfit their nets and fish, and ye fine be doubled for every offense.” Conservation wasn’t optional: The alewife was necessary for the community’s survival. Our town still has laws on the books guaranteeing widows two bushels of fish, as does Woolwich. When the alewives arrive in the spring all of their predators perk up, and a fantastic ecosystem-wide feeding frenzy begins. Bald eagles swoop above the river while the seals bounce up from below. Osprey hover and then dive dramatically, bearing the fish away in their feet, lined up aerodynamically with their flight path, like a fish-shaped basket hanging below a bird-shaped dirigible. Someday, maybe, the cod will come back to join the party offshore. Inspired by the osprey and the widows—and the bad news about other fish—I’ve been trying to teach myself to enjoy alewives. Smoked, they have the salty slick of bait garnished with a dab of road tar, liquid smoke, and a frill of tiny bones. But I’ve persevered, because dependency fosters vigilance, and thus our mutual survival. I’ve scrambled them with potatoes and chard, pureed them with white beans and spices, boiled them in milk, baked them in water, and mixed them with tomatoes—in the hope that acid would break through the funk. I haven’t yet gotten the flavor profile to flip over into the tastier territories of scotch and anchovies. But I still have hope.